We did it. Well, we did half of it. But believe us, taking the 50km option of the Dixons Carphone Race to the Stones 2018, with the amount of training we managed to squeeze in, was still every bit the accomplishment. We were certainly glad to see the sight of the basecamp nearing on the horizon, letting us know that our time on the trail in the searing heat was coming to an end. This year, we were down to just two from Team Wareable brave enough to take on the ultra marathon challenge once again. With our wearable tech kit, supplied by our pals at Curry's PC World, to keep us in check we also had some ultra trail running-friendly kit to put through their paces too. So how did we get on? 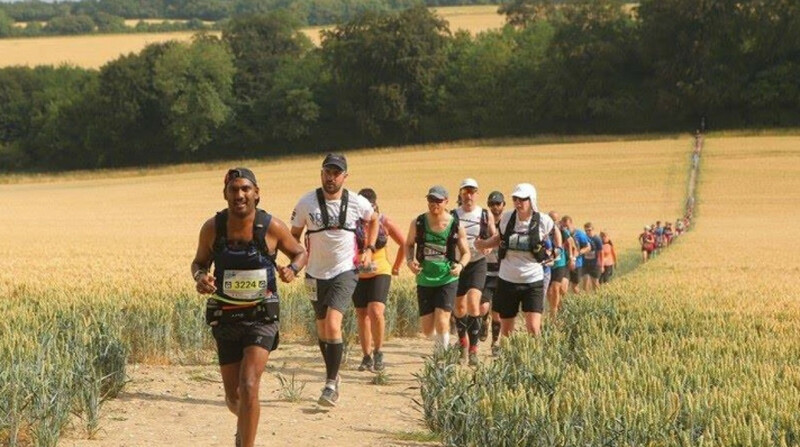 Here's the story of how two runners (and walkers) tackled Race to the Stones 2018 and how the sports watches on our wrists fared in the conditions. It might sound weird to say, but having a good go at running one 50km as opposed to walking a lot of an 100km still felt just as challenging on the mind and the body. I haven't run a lot of long distances for a few months now, but I felt I had it in my legs to get through that 50k. It was just matter of overcoming the obstacles that lay ahead (or above) that would make that difficult. The biggest one was the heat. This was some of the hottest conditions I've ever run in. 50k with very little shade in the last 30k was going to be tough and it was already warming up at 8am at the start of the race. I took the advice from 2016 Race to the Stones winner Rob Forbes and invested in some salt tablets, tried not to wear too much clothing and carried very little in my bag, relying on the pit stop stations to refuel and eat lots of salty snacks to make up for the lost electrolytes. It was a bit of a step up in the wearable department too after last year. The Suunto Spartan Sport Wrist HR felt more rugged and built for the outdoors compared to the TomTom Adventurer I used to track my run with in 2017. This time I also had more faith that the battery would go the distance. Suunto claims up to 10 hours with the most accurate GPS tracking, which can go up to 30 hours if I fancied getting up the next day and doing another 50km (I didn't). With the Sport Wrist HR switched to trail running mode, I was also able to get a much better idea of when the terrain was becoming elevated and it was time to break into some walking. The screen mode switched to display the additional ascent data, giving me a clear indication that it might be time to slow things down. Sometimes that change in terrain is not always clear, but the watch offered useful prompts to remind me that the landscape was changing. Thankfully, there were no concerns with the battery life. Had I pushed to do 100km, I definitely would have needed to switch to one of the less accurate GPS tracking modes. My Suunto's battery was down to around 64% after just under seven hours out on the trail. In the heat, the heart rate monitor proved useful as well. Suunto's sensors are some of the best out there, particularly for running, so it was an extra source of information to see how much strain my body was under in the searing heat. Crossing the line at around 4pm, I was spent. I had enough in the legs to eat up the last kilometres knowing that I wouldn't have to be out there later or the following day. James was not far behind me and I think the look on his face mirrored mine. That was up there with last year's attempt. Even if it was half the distance. Not a lot can prepare you for running in the heat, running on uneven ground for long stretches along some beautiful scenery and just being mentally strong enough to make it to the end. One thing that Race to the Stones round 2 has reminded me is that I feel naked without my running watch. While some run with just that natural feeling, especially for races like this, I still feel the need to have that reference point for performance and the motivation to crank things up a notch when I think I've let the pace slip too much. And while I feel I was smart about keeping hydrated most of the time, what I wouldn't give for a hydration monitor to be packed into my watch for the next round of Stones. Any chance you can make that happen Suunto, Garmin, Polar and company? After last year's heroics in the 100km non-stop Race to the Stones, 50km seemed a pretty breezy ride. Half of last year's distance didn't seem too big a deal – despite it being a bone fide ultra marathon in itself. So, we agreed to race with just a couple of weeks to prep. It was clear to me from the outset that I didn't have enough miles in my legs to really attack the 50km. Mike's been marathon training relatively recently, but I prefer to run halfs, so come race day the furthest I'd run was 14 miles – some way short of the 33 required on the day. But with my Garmin Fenix 5 strapped to my wrist, I was ready to go. Last year's 100km slog, with a mix of walking and running, meant that I used Hiking mode, taking advantage of the UltraTrac low-power GPS mode that easily covered the 20 hour slog. This time, I went for something more powerful. I opted for the Fenix 5's Trail Running mode, which would give me accurate GPS pacing but also more of a focus on elevation – after all, the challenge of Race to the Stones is the amount of climbing, especially in the first 50km. Under the cover of woodland the first 20km flew by – protected from the sun that was baking the Oxfordshire countryside. Perhaps our pace was just too high, averaging in the 9 min/mile range – knowing that is the benefit of running with proper GPS. It's hard to regulate your pace when you're feeling good, and those miles caught up with me – and I was walking by 30km. The rest stops don't come precisely every 10km, and I'd also failed to take on enough water at stop two. I was crawling to the 30km rest stop, bottles empty, feeling faint and weak. "Race over," I text Mike. "I'll be walking in from here." But getting my hydration back in check, life came back to my legs. Thinking of the three hours it would take me to walk the rest of the route spurred me back into running – and I was able to cruise through most of the course, stuttering to the end. I crossed the line in a respectable 7.5hr – just 30 mins behind Mike. I didn't have a time in mind and given the heat, I don't feel any shame in walking a couple of miles in the middle. That's the beauty of trail running, sometimes you just need to look at the views and remember you're having a great day out. But it's a mark in the sand, and I now have a 50km time to beat – and having done my second ultra (my first with the sole intention of running everything) a marathon doesn't seem so bad after all.